Pause is a strong graphic pattern using typographic characters that notify the reader to stop and pause, so is a literal, and amusing, descriptive title. The design, using typographic characters not frequently featured as decorative motifs, is a repeating pattern of three periods followed by a comma, with the second row offset one space. Pause is from 2×4’s Chatter collection of wallcoverings produced by KnollTextiles. 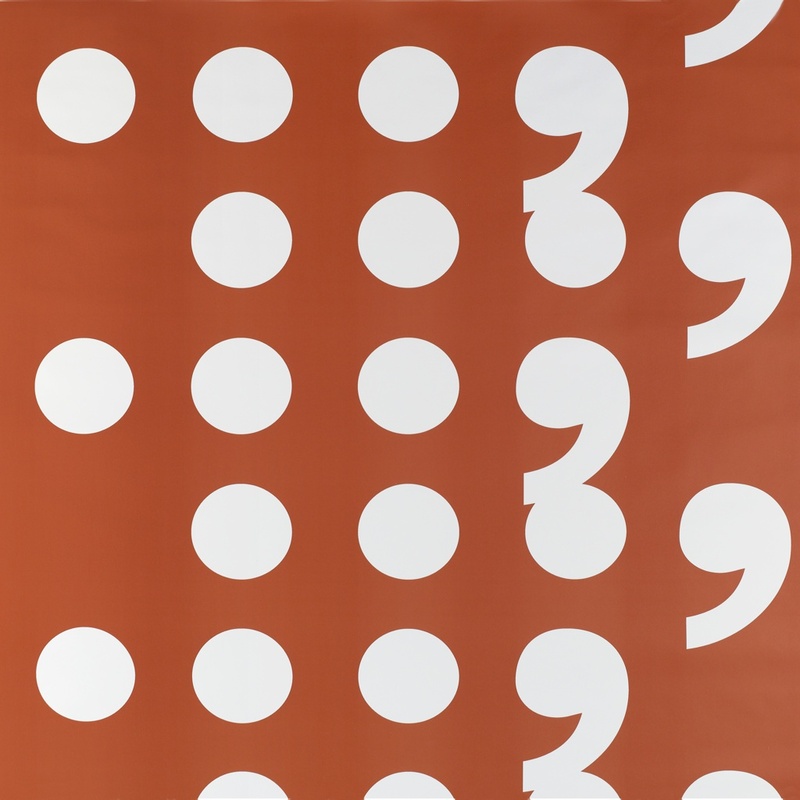 Typography has been used as a motif in wallpaper design since the 1920s, when French artist Jean Lurçat inserted nonsensical messages into some of his Dada wallpaper designs. In the 1950s, Alexander Girard created a pattern of closely spaced capital letters and numerals having the appearance of random strikes on a typewriter. Printed in a single bold color on a contrasting ground, like Pause, the designs are quite striking. The use of typography as a decorative element reached its peak in the 1960s, with designs resembling graffiti, and mod murals composed of large-scale overlapping letters. Earlier examples tend to involve more words and phrases, while designs from the 1960s begin featuring typographic characters as motifs. Typography was first used on children’s papers in the 1870s, but served an educational rather than decorative purpose. While the use of typography as a decorative element has been around for a while, this design shows it being used in a unique way and helps demonstrate the evolution of type as a motif. 2×4, a design firm based in New York whose focus is brand strategy for clients who value the power of design, was the winner of the National Design Award in Communication Design in 2006.